Davido's Boo Chioma, has recently been trending online after her Billionaire Singer boyfriend Davido got her a 45million Naira Porsche car as birthday gift. See here. The two lovebirds who are so much in love with each other, took over social media, serving everyone the couple goals with cute selfies, tongue licking, French kisses and so on. A Nigerian lady who feels that Chioma's attitude with her boyfriend is against moral ethics and not pleasant has lashed out. 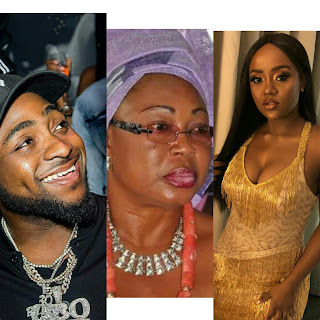 According to the lady identified as Emil Rock on Facebook, she opined that a good mother won't let her daughter mingle with the likes of Davido and behave in such a way. She added that Davido is a loud mouth and morally bankrupt and undeserving of an Igbo girl. "Where's this stupid girl's mother? So this your child has grown sooo big for you to be corrected & directed? What a family. So this mannerless, violent, loud mouthed, morally bankrupt boy is the best thing that can happen to your daughter? You are truly an igbo woman; 'money covers it all' is your sign post. May the good Lord bless your weakness & over indulgence."